The perfect accessory from day to night. 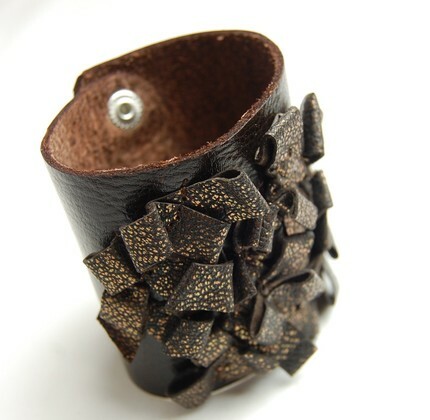 This Leather Soiree Cuff combines sophistication with fun in genuine chocolate brown leather with hand made folds and swirls in a gorgeous antique copper leather. You can get it on Etsy.com, made by AO3 Designs. Our solid brick studio, built in 1870, is located in historic city of New Ulm in the Minnesota River valley of southwestern Minnesota. Our Bohemian and German heritage community has many interesting attributes including the 2nd largest family owned brewery in the US, the highest percentage of people with German Ancestry in the US, the college with the most pipe organs in the US, and the largest butter-packaging plant in the US. So now you know.